I was expecting the meeting on future supermarket provision in the Louth area, held on Tuesday 1st April at the Dance Garage, to devolve into more of a bun fight, given some of the more heated remarks that have appeared in the press and online recently. However, the meeting, organised by Move Louth Forward and chaired by Councillor Tony Howard, was a very civilised and informative affair. I counted just over 50 people in attendance, including councillors and press. Alan Mumby of Keep Louth Special introduced their case, but first emphasised their common ground with MLF: "We share a passion for our town. "However, he cited 600 campaigns across the country where supermarkets had "sucked the life out of towns". "We are not anti-supermarket," Mr Mumby said. "Do you want a supermarket if it meant the decline of a town?" Alan Grantham explained MLF's views. "Shopping provision in Louth is not sufficient, and it's going to get worse. Many travel to Grimsby and Cleethorpes. A third supermarket would encourage more people to shop in Louth." He put the case for a supermarket on the cattle market site, saying "ELDC would save the �70,000 a year it costs to maintain that site." Darren Dodds called for ELDC to hold an evening meeting as opposed to a daytime one. "I am concerned about the cuts in public service," he said. He questioned the assertion that the cattle market is too far away, saying "It's not a proper out of town site. We may get one on the industrial estate." Referring to the idea of a supermarket on the cattle market site, he said "I'm not so sure it will damage the town." ELDC recently commissioned an updated report on retail by Nathaniel Lichfield and Partners. It's heavy reading, and full of statistics. Councillor Adam Grist quoted its finding of a 32% leakage in food spend. "The current supermarkets in Louth are overtrading," he said. "Morrisons by 40% and Co-op by 30%. ... Despite Aldi, they believe there is room for another supermarket." I don't understand exactly what overtrading means with regard to retail, but it doesn't seem to have any relation to the usual definition to do with a business exhausting its cashflow. Nick Louth brought out the statistical fencing. "Not a single poll has found that people in Louth want a supermarket," he said. He cited a number of polls, including this one I did. He clarified that the current KLS petition about the cattle market has been running since November 2013. There had been one in 2008. "At that time petitions had no legislative impact. Now under Localism they can trigger a local referendum," he said. Mr Louth also questioned the definition of Louth's catchment area used in the Nathaniel Lichfield report, which goes up to the edge of East Lindsey. I've mentioned before how surprised I've been by how many people shop in Louth from out of town. Having done a number of surveys in the town centre, as well as petitions for the libraries in 2013, I've spent a long time with a clipboard in hand, talking to hundreds of people and asking them where they're from. I'd estimate between 25% and 40% of people shopping in Louth are coming from outside Louth, particularly from Grimsby and other towns in East Lindsey. In the winter months, less than 5% of the people I spoke to came from outside the county, but obviously this increases in the tourist season. This is anecdotal, but if it's accurate then it balances nicely with the leakage of about a third that Louth is purportedly getting through people shopping elsewhere. Back to Nick Louth, who pointed out that 3000 square metres is the largest the cattle market site might be. "There are all sorts of reasons people might go to an out of town supermarket," he said. "Many of those reasons would not change. If you park at Morrisons or Co-op it's just a five minute trip. The cattle market is actually a really long way. All the evidence is that the arrival of out of town shopping would cause huge damage." However, Councillor Grist disputed this, saying the distance from the cattle market to the town centre "wasn't very far at all." He cited a report by Southampton University that points to the benefits of edge of town supermarkets. Councillor Sarah Dodds spoke of the difficulty of this decision. She raised the point that there were two prominent issues that people brought up when she was canvassing for the County Council election in May: a skate park, and supermarkets. "I think we've got a much more complicated picture than we think we've got. We need to understand not Nathaniel Lichfield or MLF or KLS, but what you tell us." She made a plea for people to get involved with the official process. Councillor George Horton asked whether Louth needed or wanted a supermarket. "Does it have to be on the cattle market? What will it cost to sell it?" He warned that the money from the sale "may not be put back into Louth" and instead could be spread out over the whole of East Lindsey. "If we do want a new supermarket, why does it have to be in the cattle market?" "Supermarkets close town shops. We've got our supermarket, but we've got nothing else," Councillor Horton concluded. Councillor Horton runs a business in the cattle market. His statement suggests that he's advocating a supermarket on the industrial estate, but unfortunately he left the meeting before he could clarify his position on this. "Louth is not being provided for," Rick Aron of MLF claimed. "The way we shop is changing. All town centres are damaged. We do need a third or a fourth choice. I have seen my home town of Horncastle stagnate." Nick Louth criticised the assumptions of Nathaniel Lichfield report, which forecasts population growth in Louth's catchment area to rise from 29,216 in 2014 to 30,580 in 2018 and 32,285 by 2023, which he believed too high. He also labelled the Southampton university study "very contentious." "Why are there so many ghost towns?" Mr Louth asked, if supermarkets are so beneficial. "Louth is doing pretty well, and it's not by chance. None of us here have any control over the provision of businesses. ... It depends on whether they think they can make money." Councillor Grist called the various reports "quite meaty stuff." (I disagree - they're more like cocoa laced with Valium.) "You can use these figures to put forward any case you want to make." Councillor Grist defended the council's decision to commission an expert report. "We want to understand the needs and the wants," he said. However, he disagreed with the idea of a supermarket on a site such as the industrial estate. "The least worst site is the cattle market. It certainly isn't out of town. Arguably a supermarket on the cattle market would be damaging to the town centre. ... A third of the spend outside Louth and 40% overtrading tells me Louth could probably accommodate a new store." "The scrutiny was not about supermarkets," Councillor Pauline Watson said. "It's about whether we keep the cattle market in Louth. I can't be predetermined. If we take the cattle market it will change the nature of this town. There needs to be a cattle market." She went on to suggest that a large supermarket would close down one of the existing supermarkets. "There is a very serious danger that if you have a supermarket you would only have one type of shop." Neil Sharpley turned Councillor Grist's point about people spending money out of town around. "You are asking yourself what is lost. How much will come back to Louth?" He was critical of how little the NLP report says about this. "If the future of farming is more organic then there will be a greater need for a cattle market." One lady whose name I didn't catch spoke about how run-down Alford is. "The town is boarded up," she said. She was in favour of a decent-sized supermarket for Louth. Yvonne Andrews described her shopping experiences. "We do go to Asda in Grimsby," she said. She was critical of the expense of shopping in Louth's Morrisons. "I do think that the cattle market needs to stay up there. But we do need a large supermarket and I don't think that Aldi is going to make a difference." Alan Mumby offered the statistic that large supermarkets put 5% of their profits back into the local community, whilst small shops put back 50%. "Our proposal puts in a climbing wall," he said, referring to KLS's detailed plans for refurbishing the cattle market. Alan Grantham asked how KLS would purchase the site. Nick Louth wasn't able to give specifics as yet. "We have a plan for specialist retail for things that aren't in Louth: climbing, outdoor equipment." He described the price of a new cattle market as "millions of pounds." "We wouldn't have trouble raising money for a new climbing wall," Mr Louth said. "We want to have that site used every hour of every day." "Supermarkets are inevitable," claimed Rick Aron. He also expressed concern that councillors think they are "prejudiced by having dialogue with their electorate." The whole matter of prejudiced decisions is something I find worrying, because its effect seems to be to stifle debate and discourage councillors from saying what they really feel. Councillor Dodds was clear about the complexity of the issues and people's experiences. "We are not talking about the closure of the cattle market." She pointed out that any supermarket application would also have to go through the regular planning process. 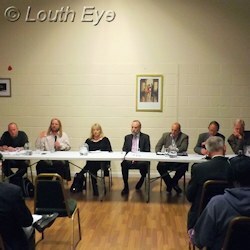 However, Councillor Dodds expressed concerns about provision for youth in Louth. She wanted to "stop the assumption that when our kids hit 18 they have to leave. I would look at ways we can keep young people here." "Play provision could be better," Councillor Grist agreed. But he paid tribute to the "huge number of people who give up their time" to run clubs in Louth. "We're really lucky in this town," he said. He also cited the 1551 Royal Charter which ensures the town keeps its cattle market. "Even if East Lindsey wanted to, it couldn't get rid of it, but that would be a line in the sand for me." The debate was lively, and lots of figures were thrown back and forth, but by the end I felt that figures can only tell us so much. I would have preferred to have quoted more members of the public and fewer councillors, but that's often the way with these meetings. The pressure group responds to the formation of a lobby group aimed at bringing another supermarket to the town. Does Louth need another big supermarket? As the district council consider selling the cattle market, our poll shows that many people believe it does not. A new store could take the place of the derelict Malt Kiln. A closer look at some of the planning considerations. People gathered to discuss the future of the cattle market, amidst fears that ELDC are about to sell this town asset to supermarket developers.